If you have the opportunity to fly over Chicago, you will be pleasantly surprised to see typical ugly urban rooftops replaced with the beauty and greenery of eco farms. The concept of vertical farms have been taking on popularity in many cities around the world and the latest addition is to make the farms sustainable with an almost zero waste concept. Chicago’s eco farm is the brain child of ‘The Plant’, in Chicago and has nearly accomplished his dream. A vertical farm is typically in an urban area and food is grown on top of and in buildings. There are many unique techniques that must be employed, including cultivation of plants in water (hydroponics) as well as aquaponics, that make use of the fish-farming byproducts to help the hydroponic growth. 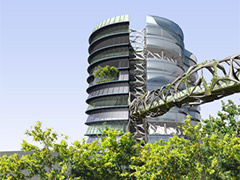 The vertical farm makes use of previously wasted spaces and turns them into food producing areas. Adel and his crew of volunteers are addressing the growing population’s need for additional food by not only vertical farming, but through the use of sustainable solutions. While the goal is complete zero waste, they are not quite there yet; but pretty close. The anaerobic digester in the plant makes use of bacteria to break down organic waste and create biogas. The biogas is made of carbon dioxide and methane as well as left over material that is used as fertilizer. The combined power and heat system converts the methane into needed energy and has allowed them to be completely taken off the electrical grid. The results for the digester is that it helps to produce large food quantities and does have a zero waste output. While still under construction and not complete, the demand for tenants has been high. Currently they have five tenants that have signed up, which include: a hydroponic farm, aquaponic farms, tilapia fish breeders, bakers, a kombucha tea brewer (a type of tea that promotes health benefits) and a mushroom garden. The products from the eco farm are sold to local markets, restaurants and cafes and are also used for the production of additional food within the farm. Edel is an entrepreneur and understands the important business aspects of such an undertaking as ‘The Plant’. His focus was to create a scenario of ‘closing the loops’. These loops include resource loops, energy loops, money loops and ensuring that the jobs are local. Edel’s concept is that keeping the loops closed will make sure that everything is more sustainable. The Illinois Department of Commerce and Economic Opportunity must agree with Edel, as they have supported the effort with $1.5 million in grant money. From the business side, the operation uses the social-enterprise model: one portion is for profit and the other side is non-profit. They offer facility tours for the public and conduct outreach programs, lectures and demonstrations for their local community to show the ways that food can be grown in various urban areas. Besides an incredible venture, the program may create around 125 new jobs in the local area. Posted on April 12th under Global Ecology.